Jeb Stuart was not the first in line to take the reins after Stonewall Jackson. A. P. Hill received the responsibility of Jackson’s corps first. Unfortunately, Hill also became wounded and could no longer fight or command the corps. Therefore, the command was passed yet again to Stuart, the cavalry leader. Some historians have reported that Stuart was uneasy and unsure of what to do when he received the command. He sent a message through Major Sandie Pendleton to ask Jackson’s advice. At this point, Jackson was delirious from blood loss and pain and could not provide much help. He replied that Stuart should do what he deemed best (Robertson 738). Before Jackson became wounded he had given permission to Stuart to take Ely’s Ford. He led a force of 1,000 men, both cavalry and infantry, to Ely’s Ford, where he was going to attack Averell’s Federal Cavalry in the darkness of night. While he was completing his planning and execution of the attack, a staff officer reported to him that both Jackson and now A. P. Hill had been wounded. This message signified that Stuart now was in command of Jackson’s corps (Stackpole 269). Leading the entirety of the Second Corps outweighed his smaller-scale cavalry battle at Ely’s Ford, so Stuart abandoned his post, leaving his men to stand guard. Before he left he ordered three rounds of shots to be fired off, hoping that this would intimidate the Federals enough to stave them off (Sears 299). Stuart himself returned to the Second Corps to take his command. Stuart was in a tough position. He was thrown into a great leadership role in the heat of battle, with no knowledge of preexisting plans. He also could not prepare any lengthy orders on his ride to the field because he did not know the casualties and positions of his troops at this time (Stackpole 273). In reality, the Confederate Army was leaderless for several hours after A. P. Hill was injured and Stuart arrived to take over. The break in fighting at this point was not what Jackson had wished. If Hill had not been injured, it is estimated that he would have driven on through the night into the powerful and ruthless Federal artillery (Sears 298). This lull might have saved the Second Corps from needless casualties, but one can only speculate. Finally, and to his great relief, Stuart received orders from General Robert E. Lee to continue pressing right “so as to unite the two wings of the army” (Chambers 427). As mentioned in the Chancellorsville Markers, Stuart’s drive and the reunion of the Confederate Army was successful, and they managed to win the battle, regardless of their inferior technology and numbers. 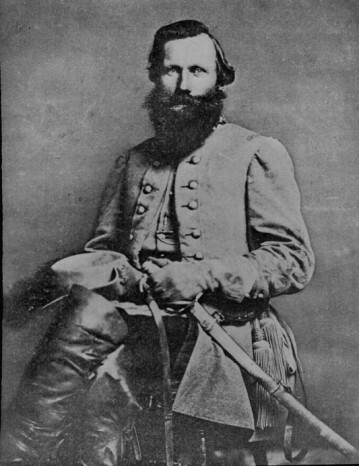 General J. E. B. Stuart was a well-known Confederate General who was in charge of the cavalry. There is an ongoing debate of whom to blame for the delay of Stuart’s cavalry in getting to Gettysburg. Lee had not given him specific orders; however, Stuart delayed and tested his orders by doing so. There is much more to Stuart’s career that is worth investigating (Robinson 8). About.com, “Jeb Stuart,” http://z.about.com/d/militaryhistory/1/0/d/2/-/-/Stuart2.jpg (accessed April 10, 2008). Robertson Jr., James I. Stonewall Jackson: The Man, the Soldier, the Legend. New York: Macmillan Publishing USA, 1997. Robinson, Warren C. Jeb Stuart and the Confederate Defeat at Gettysburg. Lincoln, NE: University of Nebraska Press, 2007. Sears, Stephen W. Chancellorsville. New York: Houghton Mifflin Company, 1996. Stackpole, Edward J. Chancellorsville: Lee’s Greatest Battle. Harrisburg, PA: The Stackpole Company, 1958.